Across Canada, publicly-funded immunization programs are provided for the routine administration of childhood vaccines against diphtheria, pertussis, tetanus, poliomyelitis, Haemophilus influenzae type b, measles, mumps, rubella, and hepatitis B infections. Each vaccine is administered according to provincial and territorial immunization schedules which vary slightly between jurisdictions. To monitor the protection of a population against vaccine preventable diseases, coverage is considered an important health indicator. It is a sensitive measure and can be used as a proxy measurement to evaluate health services, systems, and interventions. National standards for the reporting of immunization coverage in Canada were last published in 2005. Government of Canada. Immunization coverage and registries. https://www.canada.ca/en/public-health/services/immunization-coverage-registries.html – accessed May 26, 2017.
http://publications.gc.ca/collections/collection_2016/aspc-phac/HP40-156-2016-eng.pdf – accessed May 26, 2017. 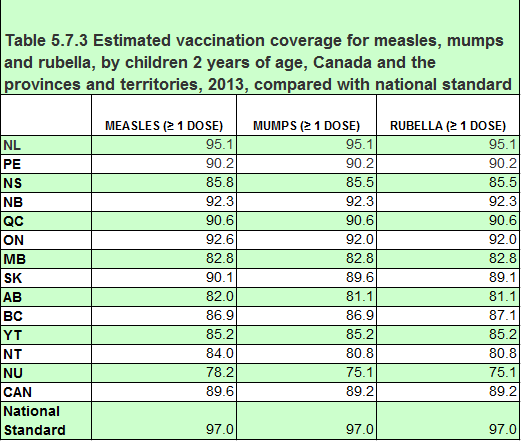 In 2013, for children two years of age, none of the provinces/territories reached the vaccination coverage rates recommended in the Canadian national standards for measles, mumps and rubella. The lowest coverage rates were in Manitoba and Nunavut. For Canada overall, the coverage rate was 7.4% below the national standard for measles; and 7.8% for each of mumps and rubella. Incomplete immunization coverage subjects Canadian children, youth and adults to risk of serious illness. Rubella presents a serious risk to the fetus if a woman contracts it during pregnancy. http://news.gc.ca/web/article-en.do?nid=1056479&tp=980 – accessed May 26, 2017.
http://www.healthycanadians.gc.ca/publications/healthy-living-vie-saine/immunization-coverage-children-2013-couverture-vaccinale-enfants/index-eng.php?_ga=1.10659505.462930771.1474382704 – accessed May 26, 2017.